World renowned speaker and expert sharing Buckminster Fuller's legacy, vision and wisdom. Author, "A Fuller View" and "Buckminster Fuller's Universe." Something amazing is happening in a small West Seattle theater. 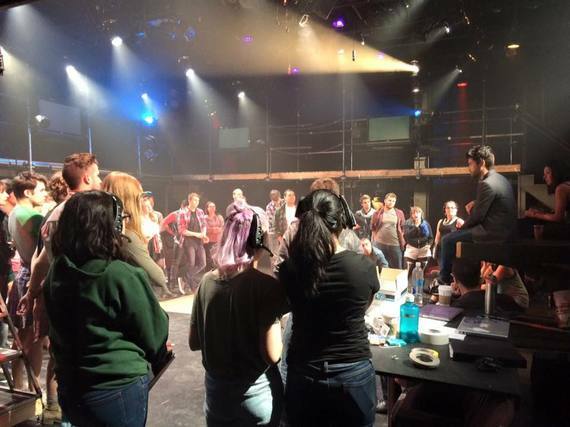 ArtsWest Playhouse and Gallery has been a mainstay of the community for quite decades, but I don't think they've ever created anything as edgy as their upcoming production of Green Day's American Idiot. Last Wednesday night I spent a few hours watching a rehearsal and talking with Artistic Director Mathew Wright, the man at the artistic helm of this new creature being birthed at ArtsWest. It's strange, interesting and edgy not only because this is one of the few non-Broadway or touring company productions of American Idiot, but also because of the immersive nature of the production. Here's the ArtsWest description of what they are doing. Equal parts house party, opera, rock concert and theater, ArtsWest's immersive, environmental staging explodes beyond the traditional theater space, as a group of lost young Americans take over an entire building and use it to tell their story. After reading this and some other material I was more confused and curious than before. I'd been to the 149-seat theater and art gallery before, and I couldn't imagine how they could possibly create this immersive vision. Thus, I ended up at ArtsWest last Wednesday as the 31 person cast prepared and rehearsed in what no longer looks like a small local theater. There are still 89 regular theater seats in the main area, but they're in a few different locations throughout the performance area. ArtsWest is, however, selling 149 tickets to each show, and the 60 patrons who buy immersive tickets get a journey unlike anything I've ever seen in local theater. Divided into three groups of twenty, they watch the show from various places in the main area plus they are guided to three other sites where they get the opportunity to interact with actors and take a deeper dive into the plot. This immersive version of American Idiot seems to provide a most interesting and strange journey as patrons climb stairs and walk through hallways before arriving at their destination. This is not to say that the audience's (and actor's) safety has not been thoroughly considered. Artistic Director Wright assured me that they were checking and reconsidering every movement of both cast and audience, and I witnessed that as the crew reworked one particular problematic logical situation that very night. Personally, I'm extremely excited to have an Immersive Ticket for opening night. Having had a glimpse into the creative process these very talented young people (many of the actors appear to be teenagers) are going though, I can only imagine how outrageous the final product will be. And having heard the eight-piece band that's part of the show performing a couple songs, there's no doubt in my mind that fans and non-fans will be entertained by a ninety-minute whirlwind of great music and in-your-face action. As there are only 149 tickets for each show and only 60 Full Immersion Tickets for each performance, I'd recommend making your reservations soon. The only question will be "Observational or Immersive"? However, if you select Immersive, the question when you arrive will be which of the three Immersive Groups will you join? In reality, there will actually be four show perspectives happening simultaneously. All this will be taking place beginning September 10 in West Seattle. Green Day's American Idiot runs through October 11.